Recently got your new iPhone? Congratulations! You deserve it. With this kind of investment, you’ll need the right kind of protection. 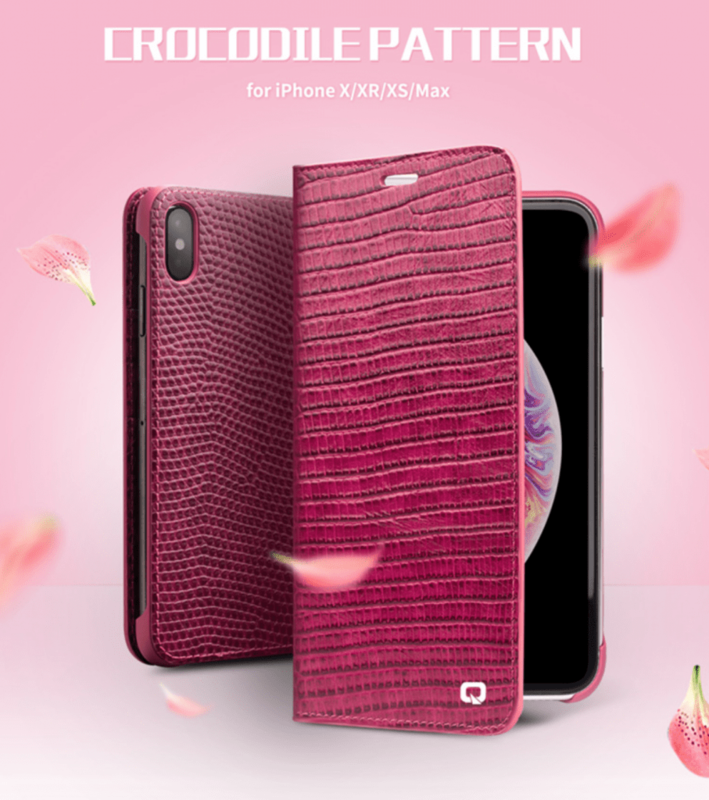 Fortunately, there are many beautiful iPhone Xs, iPhone Xs Max, and iPhone Xr cases for girls that you can buy. They’re stylish and feminine, yet tough enough to protect your iPhone from spills, scratches and the occasional drops. These cases come with free shipping worldwide, so you won’t have to worry about anything else except how these cases will make your iPhone look absolutely dazzling! Love dressing up in fine laces and dresses with flowery designs? You can adorn your iPhone in similar fashion with the Luxury Thin Flower Case. The iPhone girl case comes in a variety of colors to suit your style or mood, whether you’re planning to go on a girl’s night out or an evening gala. The flower case brings out your iPhone’s natural sleek physique without revealing too much. 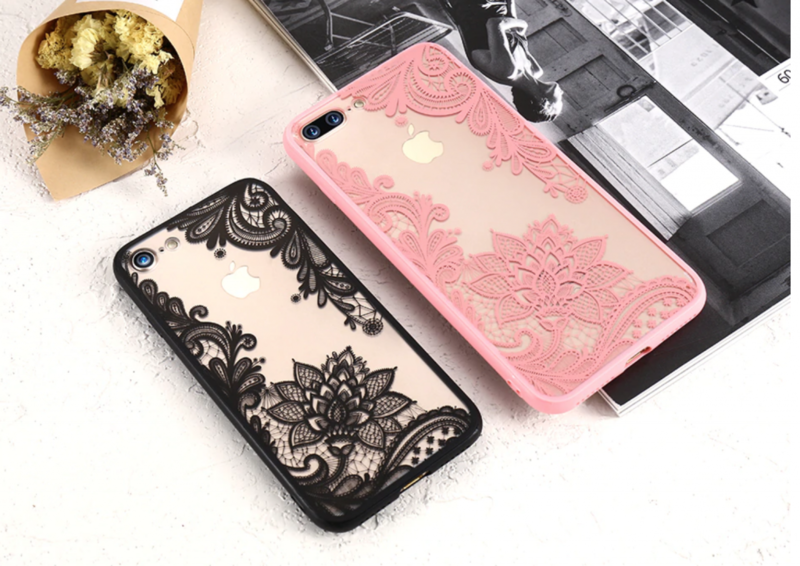 The intricate, feminine design looks so real that at first glance you’ll think your iPhone’s wrapped in the finest lace material. It comes in Black, White, Pink or Red, and offers full protection for your precious device. The case is ultra thin, giving a “barely there” look that only adds to the overall effect. The case’s acrylic and TPU material protects your phone from smudges, scratches and mini-shocks. It’s light, thin and the grip is absolutely exquisite- perfect for the discerning buyer. Can’t get enough of pastel hues and dazzling sequins? Then the Bling Foil Sequins iPhone girl case is for you. The unique back cover holds a ticklish surprise that’s sure to get you “oohs” and “aahs” from your girl friends! 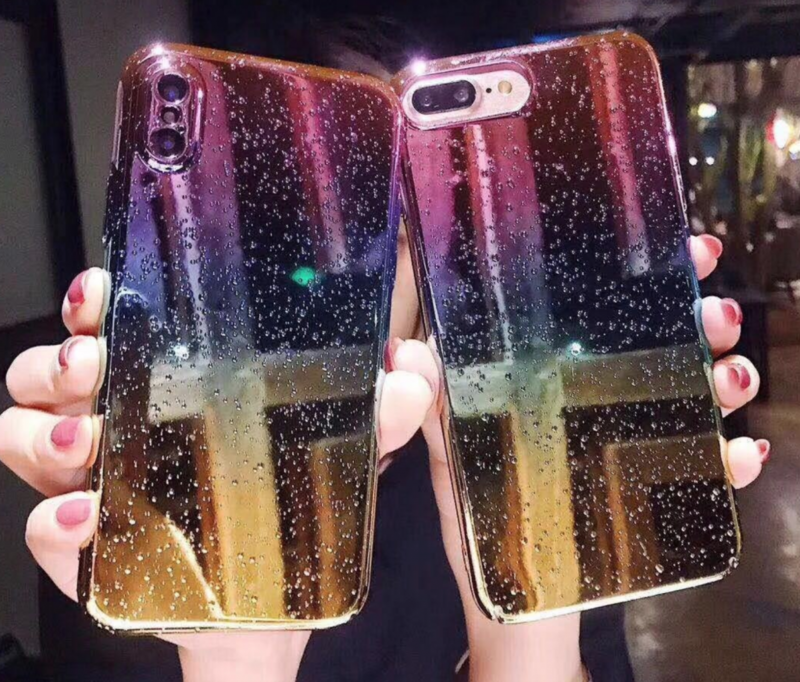 You see, the soft TPU case with its translucent shiny sequins was made to reflect different hues according to your iPhone’s color. 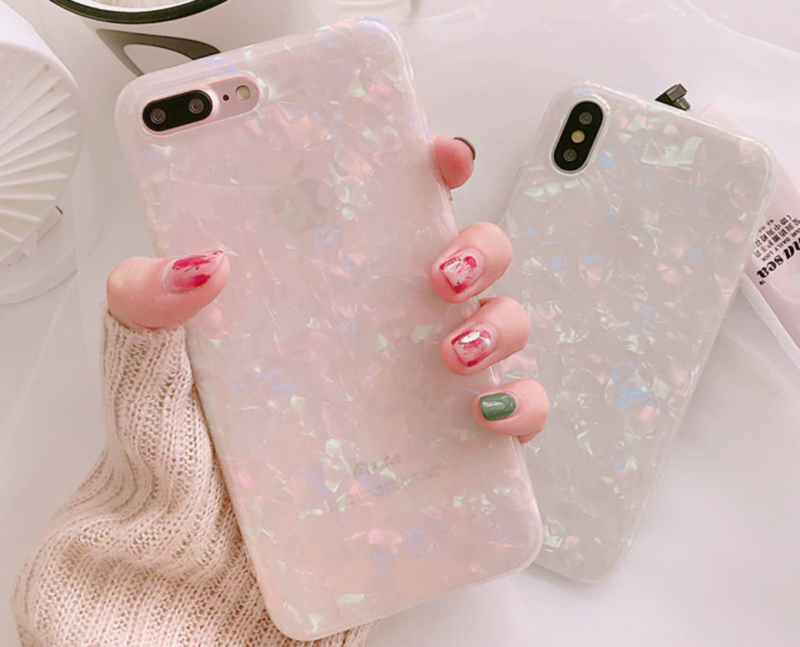 Silver iPhones bring out a milky white background with the sequins melding in the background; Black iPhones enhance the seashell design and make the colors brighter, and Rose Gold iPhones make the cover pink and very pretty. The case looks great on any iPhone, but users won’t be lacking in the protection department. The anti-fingerprint, dust and dirt-resistant cover fits very snugly and wards off scratches and the occasional bumps and falls. The Bling Foil Sequins Case will surely add to your girl power with its shine and sophistication. There’s glitzy, and there’s shining-like-diamonds glitzy. When you feel the need to encrust your precious new iPhone with thousands of bright, sparkly jewels that catch the light, then you simply must consider buying the Bling Glitter Case. Nothing says “Look at Me!” than an iPhone case that’s filled to the brim with sparkly jewels. Mix and match your iPhone with color options such as Red, Gold, Blue, Purple, Green, Silver and Pink to go with your mood or dress. It’s the perfect case for your iPhone when you’re out shopping, catching up with friends or attending a premiere event. You can also use it as your everyday cover for when you need to protect your precious device against everyday bumps, scratches, spills and falls. The soft TPU material is dirt-resistant and molds to the volume and power button quite well. The raised grooves in the camera adds extra icing on the cake. Diamonds are a girl’s best friend, so why not adorn your new iPhone bestie with a beautiful 3D case that grabs attention and never lets go? 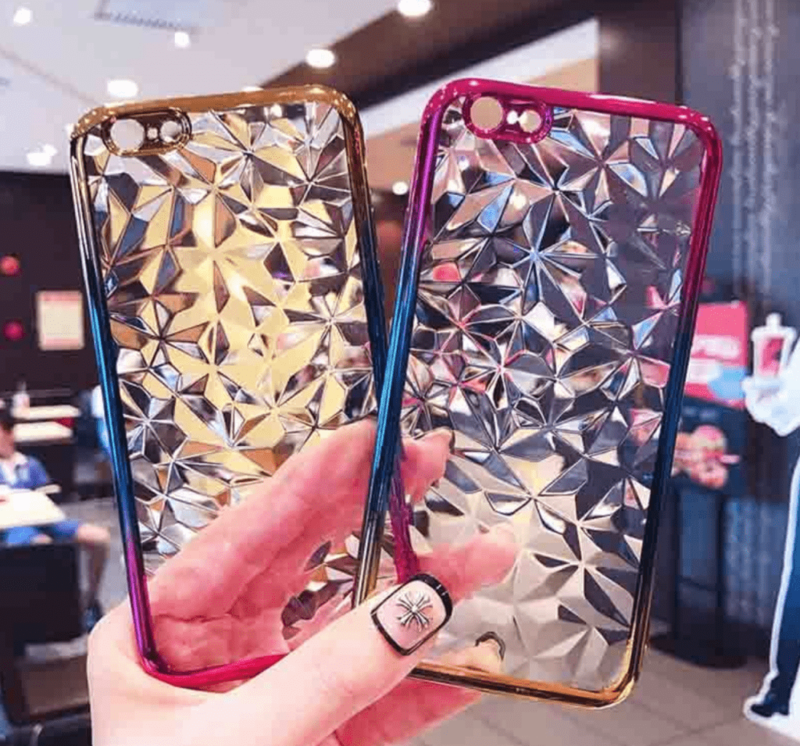 The 3D Diamond Case comes in two variants- one is a Purple Gold number while the other is an inverse Gold Purple case. The case’s gradient shading begins with neon purple, becoming an electric blue in the middle and finally a rich gold at the bottom. The printed diamonds exude a 3D effect similar to that of paned windows. The result is an ultra-classy iPhone girl case that serves as a stylish companion for your new iPhone. It’s ultra thin, form-fitting TPU material is flexible and won’t scratch your iPhone. Protection is guaranteed, thanks to the heavy duty, waterproof. anti-skid, dirt-resistant features. The grooves are just right and feel right to the touch. Be prepared to field a lot of questions as this iPhone case is a natural conversation starter! Feed your vanity every you time you glance at your iPhone with the Luxury Mirror Case. Ladies have a million and one uses for a mirror, and a handy reflection can come in handy, especially if you’re putting on lipstick or when you want to look your absolute best before heading out to the world. You can choose Silver, or Gold and Rose Gold for a filter-like effect and added style. Your iPhone back cover can double as a compact mirror and as protective case for your device. The Luxury Mirror iPhone girl case has added “airbag” reinforcements in the four corners to soften impacts and shocks when you drop your phone. The area around the rear camera’s lens are shielded from scratches via a raised groove. It’s anti-knock, dirt resistant and the reinforced sides make for optimal protection of your precious investment. It’s everything a girl could want in an iPhone case. The Ultra Thin Genuine Leather Case is the best choice if you want nothing but original, exotic leather adorning your new iPhone. It offers the ultimate peace of mind as it is designed to cover your precious device a hundred percent. The Rose color screams sophistication and femininity, and the crocodile pattern serves as a feast for the eyes. The case fits snugly, and the lock-on feature holds your phone securely as you go about your day. Open the flip cover and you’ll be treated to useful features as expected of a multi-purpose product. Directly opposite your phone screen are three card slots for your credit cards, ID and other invaluables. There’s also a small pocket for cash and other important notes. 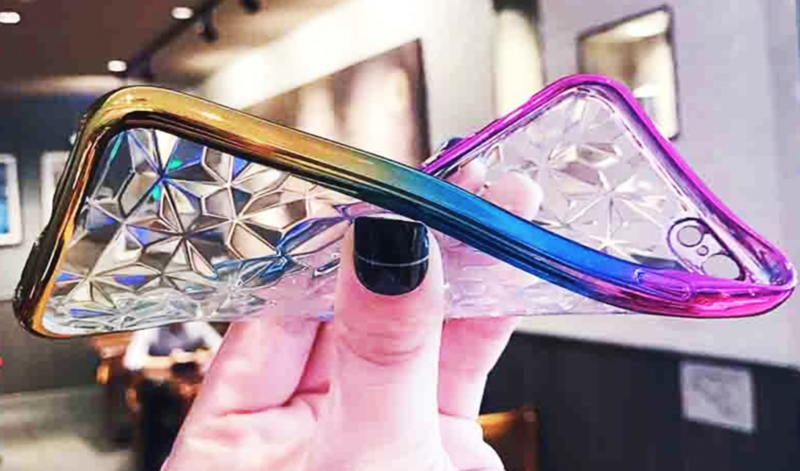 You’ll be sure to get a nod of approval from the fashion police when you take this iPhone XS Max case with you in clubs, restaurants and virtually everywhere you go. Bring something classy and completely different to the table when you choose the Dot Silicone Case for your new iPhone. The polka-dotted design is stylishly retro and goes well with almost any wardrobe, bag or accessory you have in your closet. The snap-on mechanism makes it easy for you to switch iPhone girl cases. The Polka Dot Silicone Case comes in Purple, Pink, Green and Black. Mix and match according to your clothes, mood or depending on your new iPhone’s colors. Under all that girly sweetness is a tough, durable material that can withstand shocks, drops and bumps. It’s also fingerprint proof, dust proof, and it doesn’t block your phone’s signal in any way. Key areas such as the screen, volume rocker and rear camera lens will be 100% protected. They say classic patterns never go out of style. Show the world that polka is still around with a definitive fashion statement! Not all that glitters is gold, and some glittery things are more valuable and attractive than others. 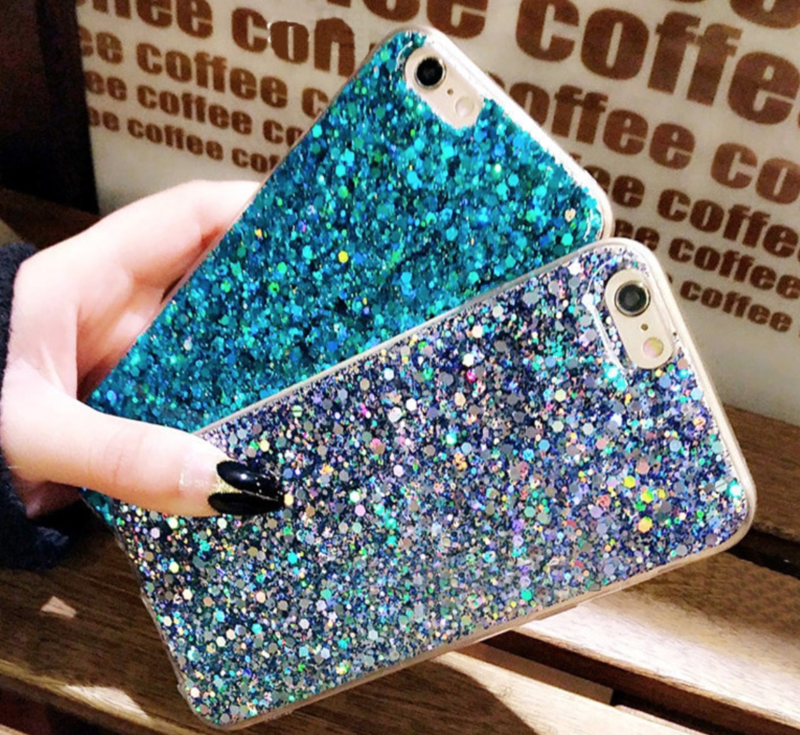 Case in point- the Mirror Glitter Case is a sparkly creation for your new iPhone. It’s the perfect complement for your phone’s sleek lines and ultra high-res display. The back case’s finish will remind you of drops of rain, like you’ve left your iPhone outdoors. The many minute droplets catch the light and reflect it along with the subtle gradations embedded in the cover. You can choose gradient hues, from YH, HLJ to CFH and JH. The sparkly mirror-like finish of this iPhone girl case not only produces a lovely effect, but proves itself quite useful when you need to check your reflection before heading outdoors. 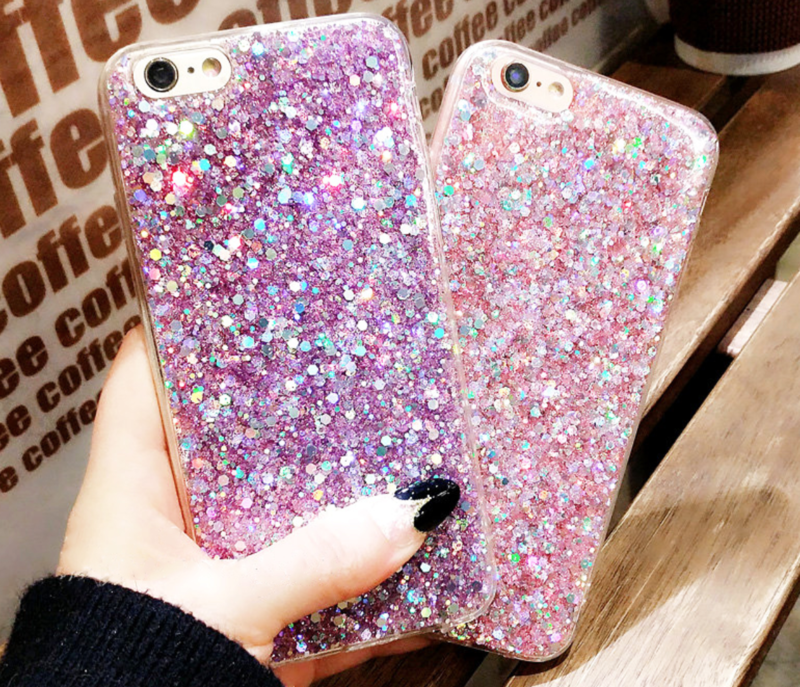 In terms of protection, the Mirror Glitter Case has you covered. The hard PC construction will shield your iPhone from scratches, bumps and scrapes that could mar your beautiful device. It’s dirt resistant and anti-knock too. Go “aww” over these extra cute iPhone girl cases and choose between Panda Blue, Polar Pink and Brown Bear Yellow. There’s even a surprise waiting for you at the top of your iPhone case, which is sure to brighten your day no matter how gloomy it seems. 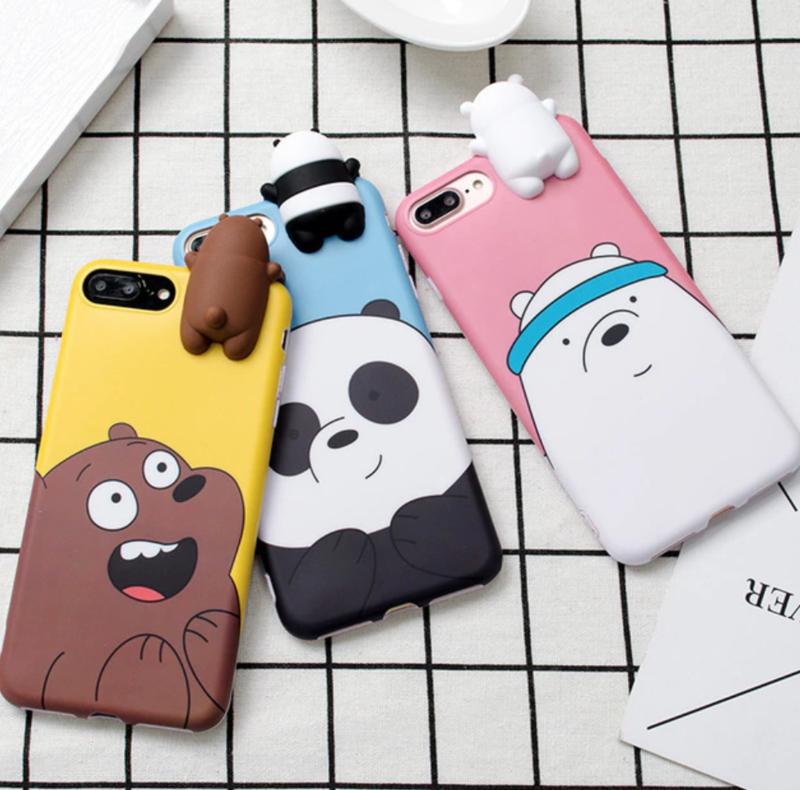 The We Bare Bears cartoon characters are depicted in bright colors over the soft, flexible material. At the top is a 3D miniature version of the chosen bear in toy form peeking over your iPhone screen. It’s chic and displays a fun side to your personality. You can squish the toy bears as though they’re your very own. The anti-knock features will come in handy when things get busy. You get top-notch protection without sacrificing personal style. The cute case for girls snugly fits into your iPhone and comes with a raised indention to prevent rear camera scratches. You can count on these bears to cheer you up and shield your investment from harm. Sometimes the simplest is still the best kind of fashion. It could also be that you’re looking for a very particular shade for your beloved iPhone. 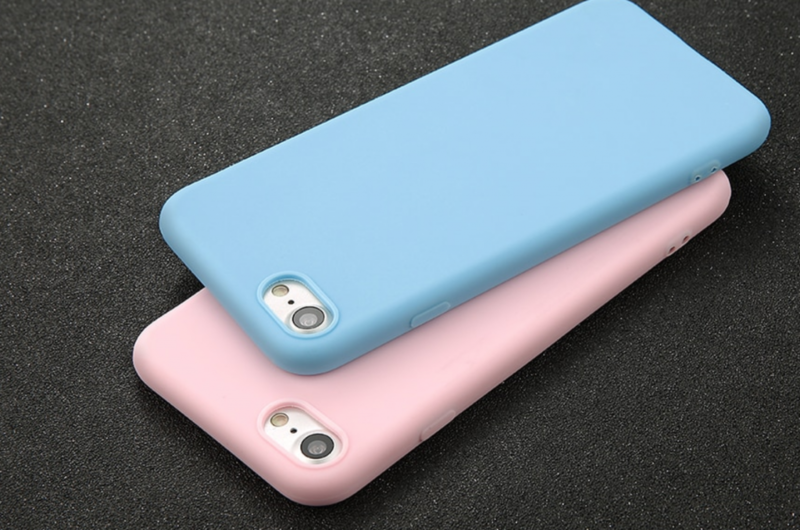 Whatever the reason, take a look at these Simple Ultra Thin Soft TPU Cases and pick out a color that best suits you. The ultra thin back cover comes in Black, Blue, Green, Pink, Red, White and Wine Red. If the color selection isn’t enough, you’ll find the smooth material a good canvas for personalization. Put some stickers, a decal or even some glitter or jewels for a truly one-of-a-kind creation! The slim-fitting form makes the iPhone very easy to hold. It’s so thin that you’ll sometimes forget that you put on an iPhone cover. The TPU material is anti-skid, scratch resistant, anti-knock and shockproof while being resistant to dirt. When you need a no-nonsense iPhone case for girls that does the job, then you’ve found the right item. Want to see more fabulous choices for your new iPhone XS Max? We also offer luxury cases that can be the perfect companion for your prestigious smartphone. Check out our collection of top-of-the-line, sturdy and attractive luxury cases for the new iPhone.